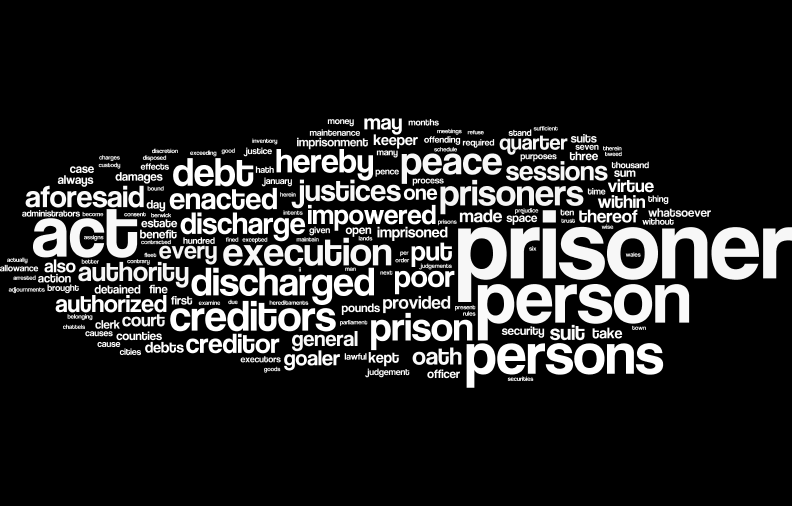 1701: 1 Anne stat 1 c.25: An Act for the Relief of poor Prisoners for Debt. Note: The regnal code for this act is sometimes given as c.19. Forasmuch as very many Persons are detained in Prison, who being miserably impoverished by War, Losses, and other Misfortunes, are totally disabled from making present Satisfaction to their Creditors, and having nothing to maintain themselves (though many of them are able and willing to serve her Majesty by Sea or Land) must either starve, or be a Burthen to the Counties, Cities, or Parishes where the Prisoners are, and may become an Occasion of a Pestilence and other contagious Diseases, to the great Prejudice of the Kingdom: Be it therefore enacted by the Queens most Excellent Majesty, by and with the Advice and Consent of the Lords Spiritual and Temporal, and Commons in this present Parliament Assembled, and by the Authority of the same, That it shall and may be Lawful to and for the Justices of the Peace, at their General or Quarter Sessions, in Open Court, who are hereby Impowered and Required to put this Act in Execution, for the Relief and Discharge of poor Prisoners, that are Imprisoned within the Cities of London and Westminster, and Counties of Middlesex and Surrey; and that in all other Parts of the Kingdom of England, Dominion of Wales, and Town of Berwick upon Tweed,, where any Poor Prisoners are Imprisoned, the Justices of the Peace, at their General or Quarter Sessions, in Open Court, are hereby also Authorized and Impowered to put this Act in Execution. I, A.B. do, upon my Corporal Oath, solemnly Profess and Declare before Almighty God, That I have not any Estate, real or Personal, in Possession, Reversion, Remainder, or in Trust, of the Value of Ten Pounds in the whole, or Sufficient to pay the Debt or Damages for which I am Imprisoned; and, That I have not Directly or Indirectly Sold, Leased or otherwise Conveyed, Disposed of, or Instructed all or any Part of my Estate, thereby to Secure the same, to Receive or Expect any Profit or Advantage thereof, or Defraud or Deceive any Creditor or Creditors whatsoever, to whom I stand Indebted; and, That I was actually a Prisoner within the Prison of , at the Suit of , and have so Continued until this Day; and, That I have not had the Liberty of the Rules of the said Prison. II. (Which Oath the Justices of the Peace, at their General or Quarter Sessions, in Open Court, are hereby Impowered to Administer, and to Examine upon Oath the Prisoner, or any other Person, about the Prisoners Poverty, if they see cause, and also the Summoner, of the true Service and Notice given to such Creditor or Creditors, their Executors, Administrators or Assigns, Goaler, or other Person) Then, after the Taking the said Oaths, such Creditor or Creditors so Summoned, shall then Cause why such Poor Prisoner should not be Discharged from his of her Imprisonment; and if such Creditor or Creditors, at whose Suit or Suits such Poor Prisoner is Detained, do Insist or Desire the Prisoner to be kept in Prison any longer time, Then, and in such Case, the said Persons Authorized to put this Act in Execution, are hereby Required and Impowered to oblige such Creditor or Creditors, at whose Suit or Suits such Poor Prisoner is Detained, to provide and give Security for a Maintenance or Allowance to the said Prisoner, not above Four Pence per Diem within the Weekly Bills of Mortality, and Three Pence per Diem in all other the several Counties of England, Dominion of Wales, and Town of Berwick upon Tweed; or else to Consent to such Prisoners Inlargement, without Prejudice to the Debt due to such Creditor or Creditors: Which if such Creditor or Creditors shall Refuse or Delay to do, for the space of Thirty Days after such Order made therein, or upon Default of the Appearance of the said Creditor or Creditors, that then the said Persons Authorized to put this Act in Execution, are hereby Impowered and Required to Discharge such poor Prisoner from his or her Imprisonment, with a Duplicate thereof. III. And be it enacted by the Authority aforesaid, That the Daily Allowance herein before-mentioned, shall be paid to the Prisoner himself, and not to the Goal-keeper, or any other Person for him; And that if within the Space of Three Months, or at the next General or Quarter Sessions, after such Security given by the Creditors for the Prisoners Maintenance, no Estate of the Prisoners shall be discovered or made out, before the said Persons Authorized to put this Act in Execution, then the said Prisoner shall be forthwith discharged, by Warrent under the Hands and Seals of any Three or more of the Persons Authorized, as aforesaid, directed to the Keeper of the Prison where the Prisoner shall be so Imprisoned, as fully, amply and effectually, to all Intents, Constructions and Purposes, as if such Prisoner had been Discharged by the Justices of the Peace, at their General or Quarter Sessions, in Open Court; and that then, and from thenceforth, the said Allowance or Maintenance shall Cease and Determine, as if the same had never been made. IV. And be it further Enacted by the Authority aforesaid, That if any Person or Persons, who shall be Discharged by Virtue of this Act, shall, at any time after such his, her or their Discharge, be Arrested again for any Debt or Debts, Trespass upon the Case, Duty, Sum or Sums of Money contracted, or due before the said first Day of January, One thousand seven hundred and one, then such Person or Persons shall again be Discharged by any Three or more of the said Persons Authorized by this Act, upon an Appearance by an Attorney in the proper Court where such Prisoner or Prisoners shall be Arrested, and the Person or Persons of such Prisoner or Prisoners shall be for ever Free, whether a Prisoner on Mesne Process, or in Execution, or any Debt or other Matter within the Meaning of this Act. V. Provided always, and be it Enacted by the Authority aforesaid, That the Discharge of any Person by Virtue of this Act, doth not Discharge his or her Debt, nor shall Discharge any other Person or Persons, jointly or severally Bound with him or her, nor any other Security, nor any Debt or Fine to the Queen; but that all and every Judgement or Judgements against him or her, shall stand good to all Intents and Purposes against the Lands, Tenements, Hereditaments, Goods and Chattels of the said Prisoner so Discharged: And that it shall be Lawful to and for such Creditor or Creditors, their Executors or Administrators, to take out any new Execution against the Lands, Tenements, Hereditaments, Goods and Chattels of such Prisoner. VI. And be it further Enacted by the Authority aforesaid, That if any Goaler or Prisoner shall refuse to Obey such Summons or Order, as shall be made by the Persons Impowered to put this Act in Execution, at any of their Meetings or Adjournments, every Person so Offending, shall for every such Offence be Fined, at the Discretion of the Persons Authorized to put this Act in Execution, at any of their Meetings or Adjournments, every Person so Offending, shall for every such Offence be Fined, at the Discretion of the Persons Authorized to put this Act in Execution, in any Fine not exceeding Ten Pounds, to be disposed in such manner as the Major Part of the Justices of the Peace at their General or Quarter Sessions shall think fit; and upon Non-payment of such Fine, they are hereby impowered to Imprison the Person or Persons so Offending, until such Fine is paid. VII. And be it further Enacted by the Authority aforesaid, That upon any Action of Escape, or other Suit brought, or to be brought, against any Justice of the Peace, Sheriff, Goaler or Keeper of Prison, Officer, or other Person, to plead the General Issue, and give this Act in Evidence, which shall be a good and sufficient Discharge, and shall save harmless every such Justice of the Peace, Sheriff, Goaler or Keeper of Prison, Officer, or other Person pleading the same; And if the Plaintiff in any such Action shall be Nonsuited, or verdict pass against him, the Defendant shall have Treble-Costs, to be Tared by the Court where such Action shall be brought. VIII. And be it further Enacted by the Authority aforesaid, That all Persons Discharged by this Act, are freed and discharged from all Chamber-Rent, and other Fees to Goalers, and their respective Officers; and all Securities given by such poor Prisoners, or others bound with them, to every Goaler, or to any other Person in Trust for them, are hereby also discharged and made void. IX. And it is further Enacted and Declared, That every poor Prisoners Wearing Apparel, Bedding and Tools, necessary for his and her Trade (not exceeding Ten Pounds in Value) are hereby Excepted from being liable to be Seized or Attached for any Debt contracted before the said First Day of January, One thousand seven hundred and one. X. Provided always (and to deter all Persons who are by the charitable Intention of this Act to be relieved, from Abusing the Favour hereby to them intended) That if any Person who shall, in pursuance of this Act, take his or her Oath for any of the Purposes hereby appointed, shall Forswear or perjure him or her self, then such Person being thereof lawfully Convicted, shall, beyond and over and above the Penalties which may by the Laws now in being be inflicted, be committed to the House of Correction, there to remain for the space of Twelve Months without Bail or Mainprize, and there be kept at Hard Labour, during such time of his or her Imprisonment. XI. Provided always, That no Prisoner shall be Discharged by Virtue of this Act, until he or she shall produce upon Oath, before the said Justices of the Peace, who are by this Act impowered to Discharge him or her, what Estate or Effects are belonging to him or her, and what Debt or Debts are then Owing to him or her, by any Person or Persons whatsoever, and by whom, and for what Cause, and upon what Security; Of all which a Schedule or Inventory shall be Subscribed by the Prisoner, in the presence of such Justices of the Peace, and shall be by such Justices, there to be kept by the Clerk of the Peace or Sessions, for the better Information and Benefit of the Creditors of such Prisoner; who, or such of them as will joyn, may thereupon, in the Name of such Prisoner, sue for such Debts, Effects or Estates, of or belonging to such Prisoner, or so much thereof as will reasonably Satisfie him, her or them, of his, her or their Debt or Debts and Demands, together with the Costs, Charges, and Expences of or occasioned by such Suit or Suits, and after the same Recovered and Received, to render the Overplus (if any be, their own Debts and Charges first deducted) to the Clerk of the Peace or Sessions, at the next Quarter Sessions, and by him to be kept for the Benefit of the rest of the said Creditors, amongst whom the same is to be divided. And for the better Recovery of such Prisoners Estates or Effects, such Prisoner shall, before his or her Discharge, deliver unto such Justices of the Peace, or such Person as they shall appoint (to be kept for the Benefit of the said Creditors) all the said Securities, in such Schedule or Inventory mentioned, or so many thereof, as such Prisoner hath in his or her Custody or Power, or can come by; and for the Discovery thereof the said Justices, shall and may Examine such Prisoner upon Oath. XII. And be it further Enacted by the Authority aforesaid, That no Justice of the Peace his Clerk or Servant, shall take (of any Prisoner for Signing his Warrant and Summons, or for any thing by him or them done in the Execution of this Act) any Fee or Reward whatsoever; Nor any Clerk of the Papers, or other Officer that shall make out any Copies of Causes for the said Prisoner, shall take for any such Copy of Causes above the Sum of Six Pence, upon pain to be proceeded against as Extortioners; any Law, Act of Parliament or Usage to the contrary in any wise notwithstanding. XIII. Provided also, That no Person, by Virtue of this Act, shall be Discharged out of Prison, who shall really and bona fide stand Indebted in more than the Sum of Twenty Pounds to any one Person, Principal Money, and Damages, Costs of Suit excepted. XIV. Provided also, That no Person shall be Discharged, by Virtue of this Act, that hath not, or shall not, before such Oath made, as aforesaid, have remained in Prison by the space of Six Months. XV. Provided always, That no Man, being under Forty Years of Age, shall be Discharged from his Imprisonment, or have any Benefit or Advantage, by Means or Virtue of this Act, or any thing therein contained, unless such Man or Person do and shall, before his Discharge, voluntarily List himself a Soldier under some Officer or Officers of her Majesties Army, or on Board her Majesties Fleet; Any thing herein before contained to the contrary in any wise notwithstanding. Source: A Supplement to the statutes at large, 1706, p.2200.